With only a handful of shopping days left and the stores packed with long lines and the usual selection of uninspired gifts, here is an idea for a gift that is so special, so heartwarming and so utterly unique that it can’t be found in any store. 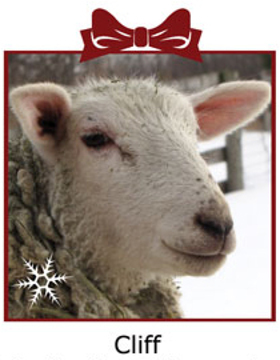 Farm Sanctuary's Adopt-A-Farm Animal holiday sponsorships enable you to give the gift of life this holiday season by sponsoring a Farm Sanctuary animal in your name, or warming the hearts of your loved ones with gift adoptions. With each adoption, you and/or your gift recipients will receive a unique and memorable sponsorship package that includes a personalized adoption certificate and a beautiful color photo. 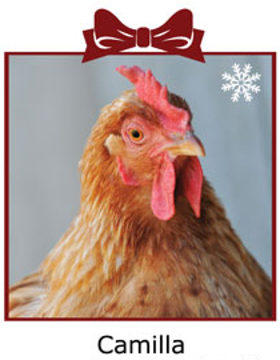 You will experience the joy of knowing that you have made a difference for a farm animal. As a sponsor, you become an essential part of your adopted animal’s life by helping provide the food, bedding, medicine, and individualized care animals need to live peacefully at our shelters. The rescued animals at Farm Sanctuary are finally safe from harm, but they rely on sponsorship support for their care each day. Your holiday sponsorship is a chance to create happy endings for animals in need and bring them comfort and joy. And when you look at the faces of the animals available for adoption, does anyone really need another sweater? Farm Sanctuary combats the abuses of factory farming and to encouraging a new awareness and understanding about “farm animals.” Through the years, the organization has rescued thousands of animals, and educated millions of people about their plight. Some of the celebrities who support Farm Sanctuary include Ellen DeGeneres, Colbie Caillat, Bob Harper and John Salley. Order gift adoptions for loved ones or sign up now to become an adoptive parent yourself!